In response to your request for information on Buicks racing at the Windsor Speedway. I have enclosed a photo of Stan Brazier driving his straight 8 Buick at Windsor. 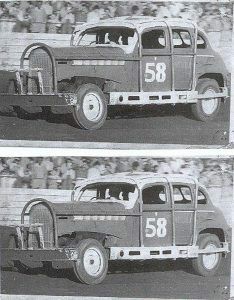 I think this would have been around 1958 as I attended the speedway a lot when I was a teenager. I can remember getting the train from Westmead to Windsor and return. The car was reputed to weigh around 2-3 tons and he was an expert at spinning other cars in the corners. Other competitors would gang up on him and try to get him to spin but the car weighed that much that it was difficult. I thought that I had other pictures but a search hasn’t revealed them. I think these where the good old days of clean competition.